Our most beloved flowers, pelargoniums (also known as geraniums), spill from the shelves of garden centres at this time of year, and it takes a really strong heart not to fall in love with them all over again! The ivy-leaved pelargonium (Pelargonium peltatum) is normally described as a climbing, semi-succulent perennial that is used extensively in horticulture. What this description doesn’t say is that they give superb flower power in window boxes, hanging baskets and containers. 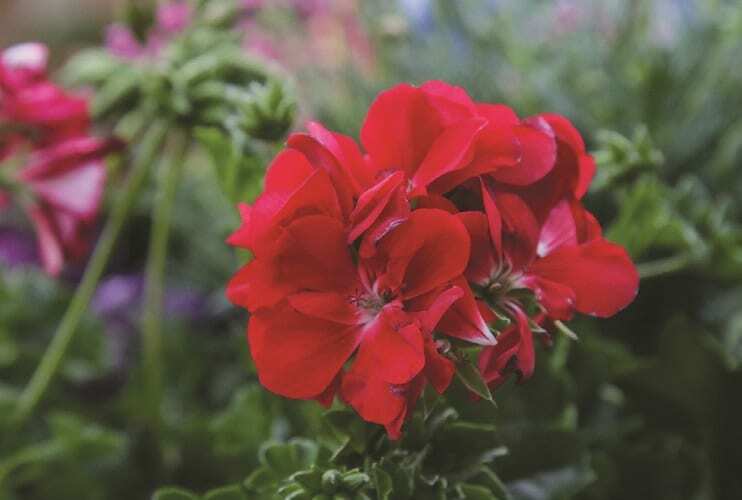 Thousands of pelargoniums are grown each year and new varieties appear regularly. We used two specimens of the new, early flowering ranges of pelargoniums, namely ‘Marcada’ and ‘Tacari’, with a selection of other champion plants in our pot. These pelargoniums are very floriferous, selfcleaning, have a high resistance to weather conditions, and need less water than other P. peltatum varieties. They have compact growth habits that maintain a neat shape, and carry their large and showy flowers above the plant’s canopy. 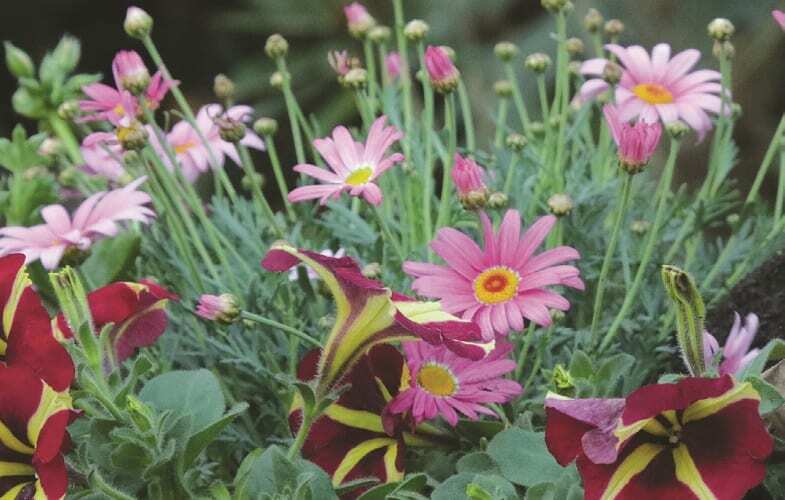 Marguerite daisies go with anything, and in here we used Argyranthemum ‘Madeira’ Deep Pink. The ‘Madeira’ range consists of upright, mounded plants with long-lasting flowers in repeated flushes. 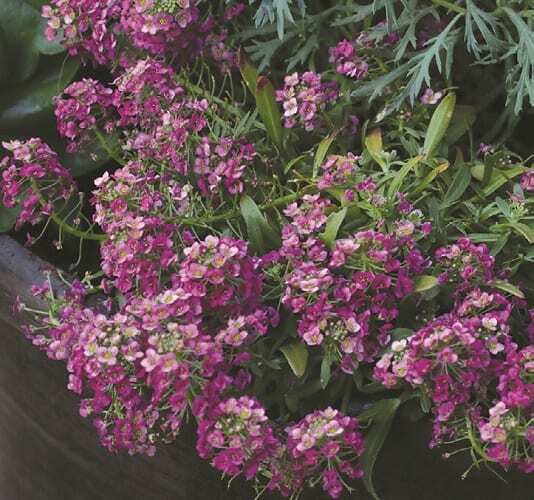 If spot-fillers are needed, call on lobularia (alyssum), and more specifically Lobularia ‘Stream’ Lavender and ‘Stream’ Raspberry. The rich shades of lilac to purple and darker pink complement the bright pinks and reds of the other pot dwellers quite well. They form densely mounded flower cushions and stay in bloom for ages. 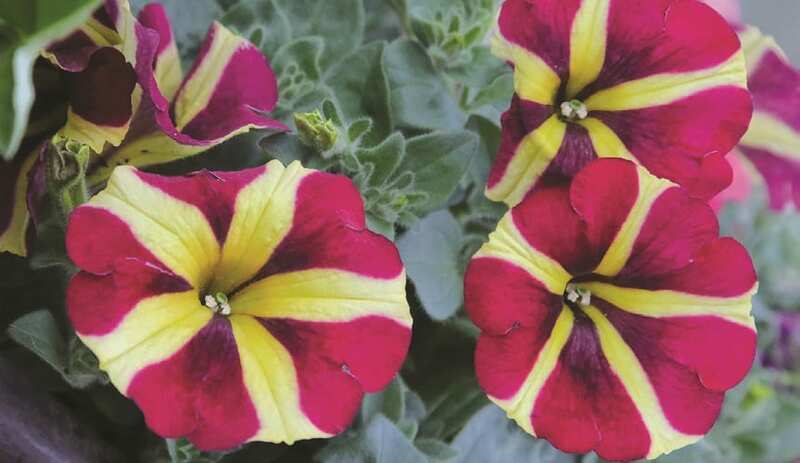 Petunia ‘Amore Queen of Hearts’ is a bicolour petunia that displays five red hearts on each bloom, with a striking yellow contrast to complete the happy look. 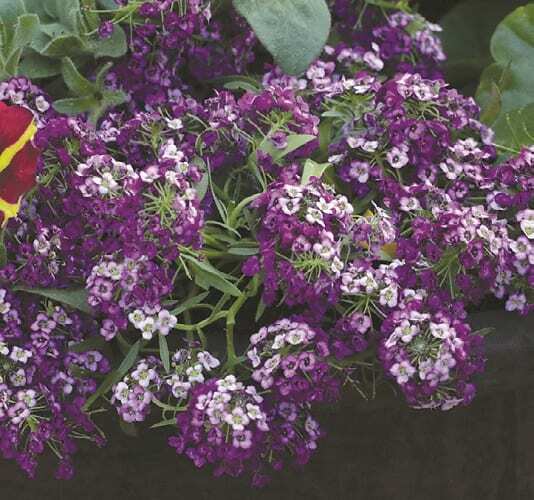 It has a semitrailing and densely blooming habit that will dip nicely from containers and hanging baskets. The ‘Amore’ range of petunias holds up well to rain. • The right spot: Full sun is best, but morning sun and afternoon shade will also be tolerated. 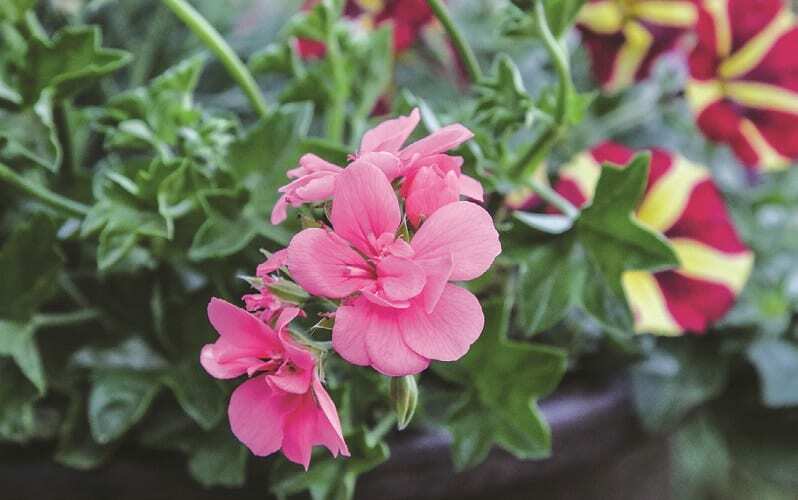 • The right soil: Pelargoniums hate wet feet and heavy, slow-draining soil. Use a good quality commercial potting mix and add an adequate drainage layer of stones or gravel before filling your pot up with potting soil. Before doing anything, make sure that the container’s drainage holes aren’t blocked. • The right food: Keeping these plants hungry for food will cause them to sulk and stop flowering. They are gross feeders and need feeding fortnightly with a water-soluble fertiliser. 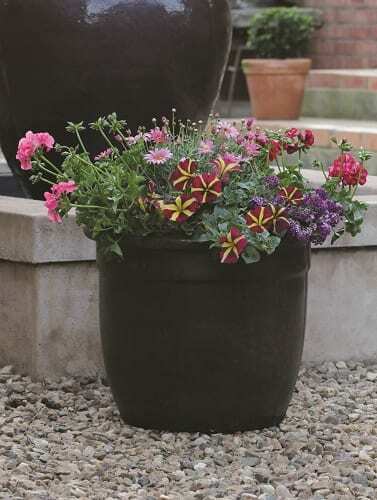 • The right way with water: Pelargoniums are quite water-wise. Allow the soil to dry out before watering at soil level, as the leaves should be kept dry to avoid disease.